Lock your backend tabs and pages to prevent them from being edited by multiple admin users simultaneously in order not to lose important store data. Effectively manage the work of admin users and increase their productivity. Mark pages that are currently being edited with a special lock icon. Display informative lock message in top of the page. Enable particular users to decline page lock. Looking for a handy tool to effectively manage the work of your staff and quickly edit store information without any data loss? It's a really hard task to do, especially when numerous admin users start editing one and the same page synchronically. This may lead to partial or even total removal of important changes made by one of the store admins. Edit Lock Magento extension will help to prevent your backend tabs and pages from being edited by two or more store administrators simultaneously and keep your store data up-to-date and clean. Mark tabs and pages which are being edited with a lock icon and block them for other administrators within a specified time period. Therefore, all data changes will be successfully saved one by one. NOTE: When someone edits store data other admin users can easily open and view locked pages as well as switch between tabs, but the editing mode will be disabled. Let admin users clearly see which tabs and pages are being edited by others. Special lock icon will be displayed on the customer, product and other grids. In case the admin user hovers the mouse over a particular icon, he/she will see the name of the store admin who edits the page at the moment. The informative message containing the name of an admin user who is editing the tab and the time when he/she started working is displayed on each page marked with the lock icon. The module enables you to set the maximal time for lock duration. For example, if you specify 30 minutes, the page will be unavailable for editing within the set time period since the first admin user started working on it. 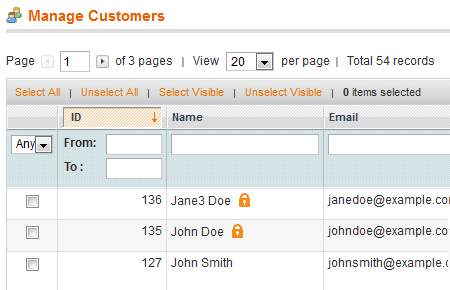 With the Magento lock editing extension you can enable particular admin users to decline the lock option if necessary. Simply tick the corresponding option while creating custom roles for such users, and they'll be able to easily remove the lock at any time they need. The module's functionality allows you to switch off the lock feature for some admin users. In this case when the admin user with the disabled lock option edits a specific page, this page won't be marked as locked and will be available for editing by other admins. I've been looking for such a module for ages. The tool is easy to navigate and use. The fewer options - the fewer problems, so this small module really does its job and does it well. Highly recommend it to everyone who runs huge stores with more than 2 admins - really helps in saving product data and avoid overlapping.